The Living Voice Vox Olympian has been in development for more than five year and now is finally available for sale. Together with the Vox Elysian bass system, this speaker creation is insanely even tragically expensive but though it may belong to our dreams only, it’s important nevertheless for us as music lovers to experience and come to terms with what has been achieved here. It offers not just a superb audio and musical experience. It is supremely capable of communicating the musical equivalent of profound human states, those moments of insight, epiphany and even enlightenment that we live for as music lovers. In the image above you get an idea of the sophistication of craftsmanship involved. The main section on top of the midrange horn, the deep, sumptuous central part that looks like bubbly toffee, is amboyna burl. The lighter inlaid stringing around it is lacewood and the dark edge is macassar ebony. 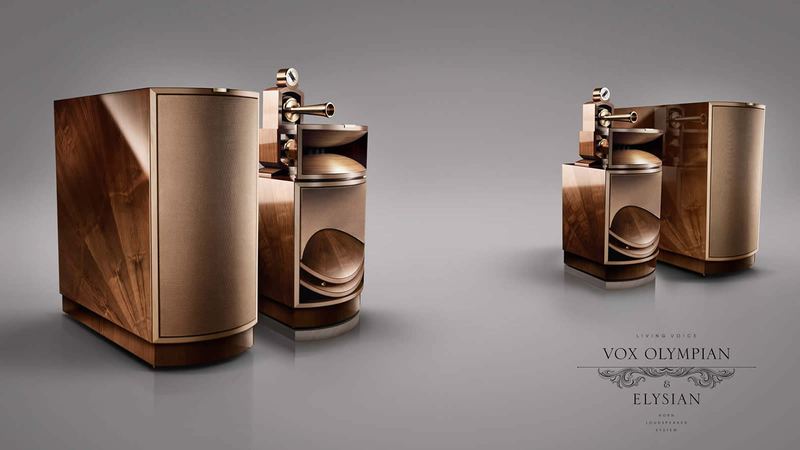 The main cabinet houses a 15-inch, paper-cone woofer with a custom-designed suspension within a modified exponential-compound horn that is hand-made of laminated beech wood. Above it is a 3-inch compression driver in an exponential horn, also made of beech. The main carcass is in macassar ebony with a sunburst motif on the side of the horn, the controls are in LG2 bronze as is the majority of the treble horn - the front of the mouth is 24 karat gold plated brass. The midrange horn and supertweeter are yet to be fitted. Proceeding up the frequency spectrum, we come to a 1-inch beryllium-dome compression tweeter at the throat of a modified exponential horn made of cast bronze. At the top is a slot-dispersive compression super-tweeter, also with a beryllium diaphragm. 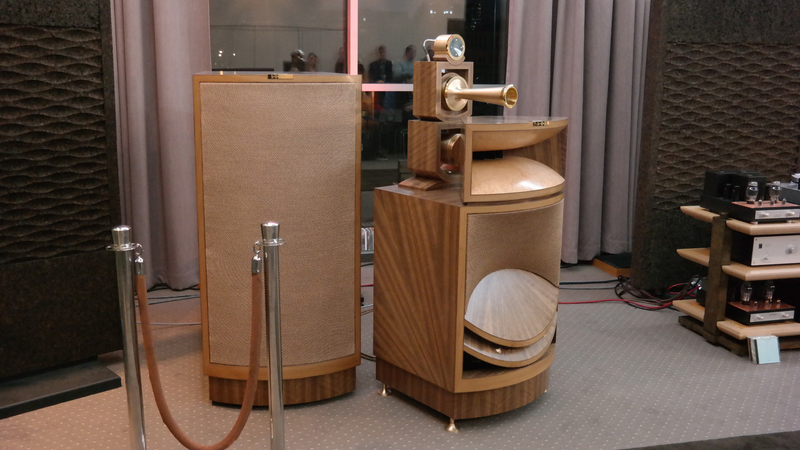 As with most horn-loaded speakers, the Vox Olympian is extremely sensitive—105dB/W/m to be exact—which means it can play plenty loud with very little amplifier power behind it, making this speaker ideal for single-ended triode amps. Unfortunately, I was unable to glean any other specs, even after repeated attempts to contact the company, though I have little doubt they are truly Olympian. Amboyna burl veneer 'reads through' from the top to the mouth of the midrange horn and thence to the double tongue of the bass horn below. The lighter yet nearly as dramatically figured veneer on the edge of both horns is ripple eucalyptus which sets off the richness of the darker veneers superbly. The Living Voice Vox Olympian badge which is made for the company by Octave Audio in Bristol is a work of art in itself. The strike or bridge is in oxidised silver and sits over an inverted ziggurat with 'Made in England' in the same material at the bottom. This side view of the midrange horn mouth reveals the way that Struik & Hamerslag have been able to curve the amboyna burl veneer in two planes to spectacular effect.